Bitcoin is booming and the value itself is skyrocketing. This year alone, its price is hiking roughly 700%+ (last year Bitcoin was around US$600-700), after plunged to $3000-ish/coin on September 2017 then on October 2017 its value rebounded and make a new world headline to first reach $5000-ish/coin. However, coming December 2017, Bitcoin hit a new world record: $14,000-ish/coin. Awesome, isn’t it? Apart from Bitcoin which is currently leading as number #1 Cyrptocurrency in terms of its market capitalization, other Cyrptocurrency coins that sit on Top 5 positions in terms of their market capitalization are (in sequence): Ethereum, Ripple, Bitcoin Cash, and Litecoin. Details can be checked here: coinmarketcap.com. Seeing all these news are great especially if you are looking into some other forms of investments. However if you are like me who are not geek enough to do all this Bitcoin and Cyrptocurrencies trading – I always ended up with mouth-watering and jaw-dropping face when these popular cryptocurrencies making another world headlines. 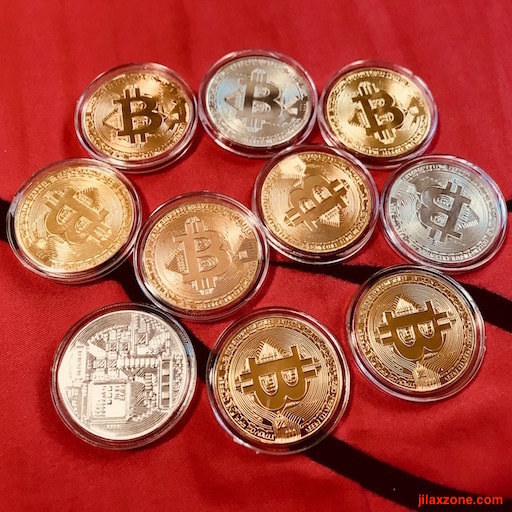 However after I did some research about Bitcoin and these other altcoins (alternative cryptocurrencies other than Bitcoin), I finally found out that there are – out there – a way to buy these Bitcoin, and other altcoins easily. What I meant by saying buy Bitcoin and other altcoins easily, is to transact via mobile phone – since nowadays most people carries a mobile phone and most of them are smartphone (either iOS or Android based). There are plenty of apps available on both Apple App Store and Google Play Store which offer to buy, sell, send and transfer Bitcoin and other popular altcoins within taps of your fingertip on your mobile phone. 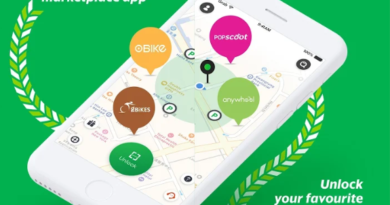 In today article, I will show you one app, which I personally have given it a try myself and now use, on how easy using this one app to buy, sell, send and transfer Bitcoin and other popular altcoins. Disclaimer: This is not an invitation. This is also not a sponsored post. I will not get anything if in the end you sign up and use their service. This article is just to show you how easy you can invest into Bitcoin and other altcoins without the hassle and being a geek. In case you decide to invest, do at your own risk. Under no circumstances will I be held responsible or liable in any way for any claims, damages, losses, expenses, costs or liabilities whatsoever (including, without limitation, any direct or indirect damages for loss of profits, business interruption or loss of information) resulting or arising directly or indirectly from the use of this article and its contents. After some time, my research about how to easily buy and sell Bitcoins ended up with Coinbase. History of Coinbase here (Coinbase about page) and here (Wikipedia page). In short, Coinbase is a digital asset exchange company which – as of today – accepting transaction from 190 countries worldwide. Coinbase as a company, it’s been backed-up by multiple venture capital firms, it also has obtained BitLicense from New York State Department of Financial Services (DFS), which authorizes the company continuing virtual currency business operations in New York. And most importantly it has served 11M customers as of October 2017. So given those facts, I – myself – am quite confident to start my digital currency journey with them. 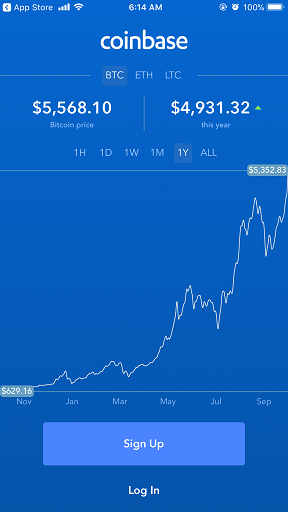 The best thing I found about Coinbase is that, the company has the mobile app which – depends on where you are and which country you are sitting now – allows you to buy, sell, send and transfer Bitcoin, Ethereum and Litecoin as easy as few tapping on your mobile phone screen. Yes, Bitcoin, Ethereum and Litecoin – that’s 3 out of Top 5 actively traded Cryptocurrencies worldwide. What’s even better, to register and verified yourself, you don’t need to go to their website via PC/Mac, you can do it on the mobile app as well. So end to end is done via mobile app. Impressive! 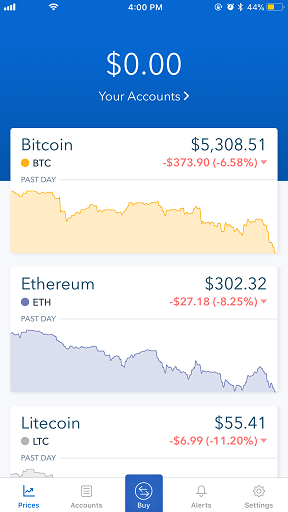 In case you haven’t decided whether or not to invest, buy, sell or trade Bitcoin and other altcoins with Coinbase, no worries, you can still use the app to just see and check Bitcoin and other altcoins price movements from time to time. Alternatively, you can use my referral link below and get $10 worth of Bitcoin. Referral link, both you and I get $10 worth of Bitcoin here. By registering using the link above, both you and I will get $10 worth of Bitcoin after you made buy/sell transactions for $100 in total. Once installed, open the Coinbase app. In order to use the app, you have to be registered. Don’t worry, registering yourself is FREE. 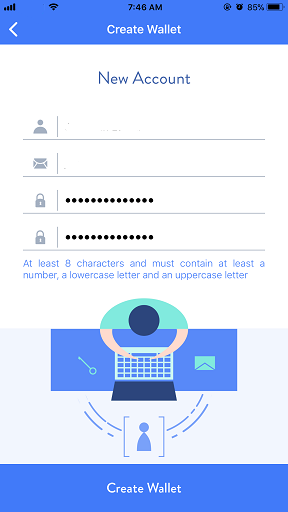 Name (recommended to put your real name which match with your identity card), valid email address and password. Once you have provided all, do verify your email address by checking your email inbox and verify. Once verified, you can now login to the app. By just registering, you can only view the current prices and values of Bitcoin, Ethereum and Litecoin. However you can’t do any buy, sell, send or receive yet. key in your valid phone number and get it verified. Depends on where you live, you may see different options here. For me in Singapore, the only available option is Credit/Debit Card. Fill in the details of your credit/debit card and gets it verified. You’ll get charged a few bucks – two times and different amount – for verification purpose. 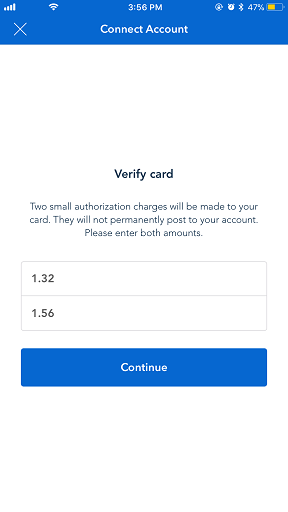 Key in the charge amount when prompted to do so to verify the Credit/Debit card. 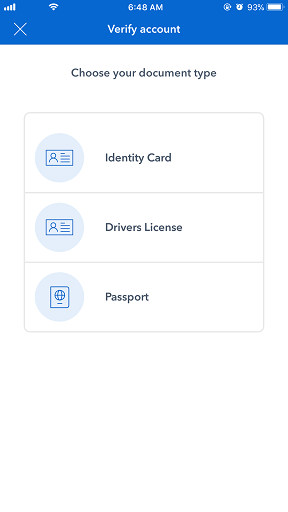 To verify your account, you have to provide and submit one of the following identity documents: Identity card, driver license or passport. Take photo of the front part and the back part and send them via the app and get them verified within minutes. In my case, it took 3 minutes to get verified. With all 3 items above provided and verified, now you are good to go to make your investment in Cryptocurrency world! 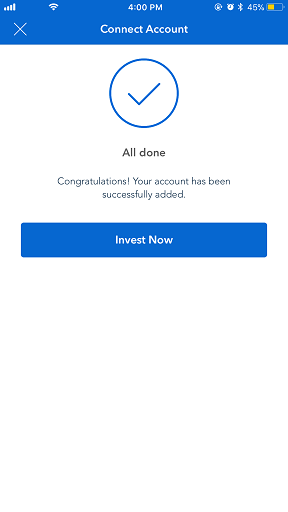 Coinbase Bitcoin app: Start investing! If after signing up you are not automatically logged in, do login yourself, provide your email address and password. Once registered and logged in, you can see 5 main menus: Prices, Accounts, Buy, Alerts and Settings. There’s no complicated interface inside the app – fortunately, so within no time, like me – you can get everything you need. This is the first menu, located on left most of the menu. At the time this article is written, Coinbase app only supports Bitcoin, Etherum and Litecoin. So tapping on the Prices menu will show you prices of these 3 Cryptocurrency coins. If you have purchased any cryptocurrency coins or get transferred from somewhere else, your investment will also be shown on Prices as well. It’s the second menu from the left. It give you a glance view on all of your accounts. Tap on each account will bring you to the buy and sell menu where you can either buy or sell your cryptocurrencies. 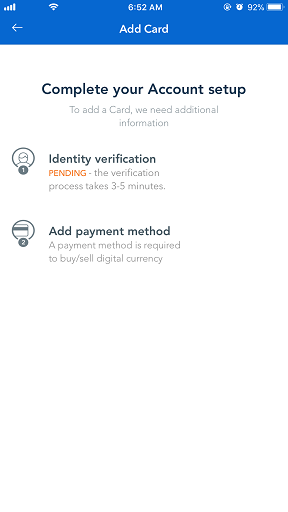 In order to buy, you need to first setup your payment method. It’s the third menu from the left. It gives you shortcut to buy the cryptocurrencies directly. Choose between the available cryptocurrencies: Bitcoin, Ethereum or Litecoin. If you haven’t setup your payment method, you will be prompted to first setup the payment method. The fourth menu from the left and my favourite one. It’s my favourite menu because it can – like its label – give me alerts whenever the cryptocurrencies reach certain level that you set. For example, today Bitcoin is US$5,000-ish per coin. 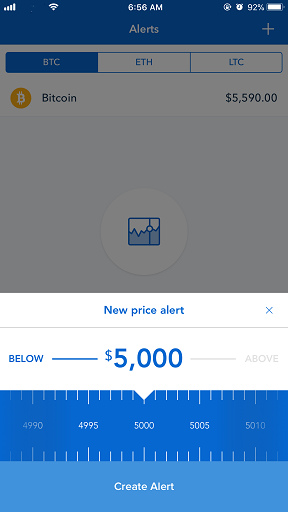 I set the alert to alert me whenever Bitcoin goes down below US$5,000 so that I can act to buy more Bitcoin and set the alert at US$6,000 so when Bitcoin does reach US$6,000 level, I can sell my Bitcoin. All is done without the need for me to keep watching its price ups and downs. The fifth menu from the left. 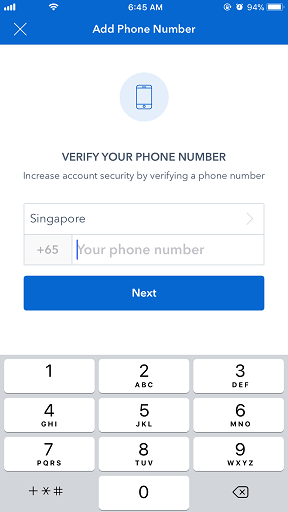 It has all the settings you need, from changing your account name, setting up your native currency and country, adding/removing payment method, adding/removing phone number, adding/removing identity verifications, even to setup passcode – so that the app is secured – no one without the passcode able to login and perform transactions. Well, I can’t really assure nor convince you that Coinbase is really trust-worthy, however you can always check around and do some verification yourself before committing anything. Easiest way is to google around about Coinbase and see what people say about the company. Like I said earlier, Coinbase is backed by multiple venture capital firms, has BitLicense and most importantly, the company has served 11 millions customers – numbers don’t lie folks. Depends on which country you are sitting now and depends on the transacted amount, buying Bitcoin, Ethereum and Litecoin at Coinbase which incur you transaction fees. For any transaction below US$200, you’ll get charge a minimum fee which will be disclosed before you execute the transaction. For any transaction above US$200, on average – for buying/selling you’ll get charged 1.49% from the total amount, for credit/debit/paypall purchase you’ll get charged 3.99%. See below for more details – information is correct as of 1st November 2017. 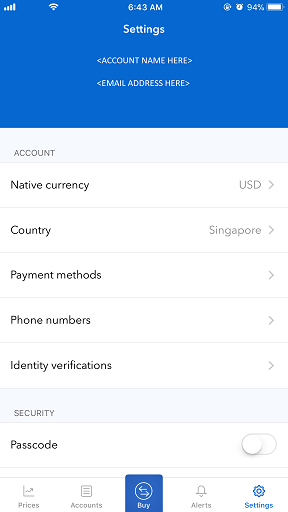 For more details and updated info for each countries, please visit Coinbase support page about transaction fees here. 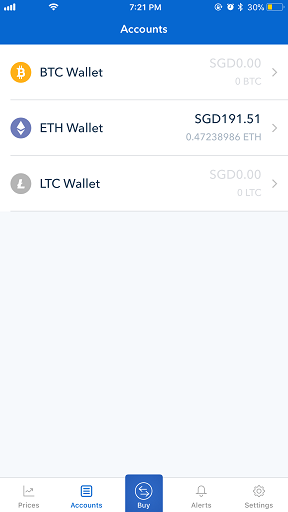 Above image is showing you, to buy Ethereum for S$200, I get charged S$7.67 for fees. That’s roughly 0.03%. 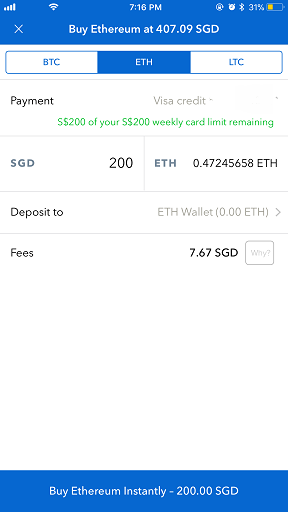 However in my case, on my credit card statement, I got charged S$2 only – not sure why, so when I bought Ethereum for S$200, on my credit card statement it was reflected as S$202. So far you have seen Bitcoin prices blow up like nothing before it and most probably you have heard those who have early-invested in Bitcoin (and other altcoins) now become rich, however do take note, investment always carries risk. Unlike government secured investment products or fixed deposit which you may not lose your principal amount, investing in Bitcoin, Ethereum and Litecoin at Coinbase and other altcoins at other places may get you to lose all your principal amount which in the end you’ll get nothing except those digital cryptocurrency coins. 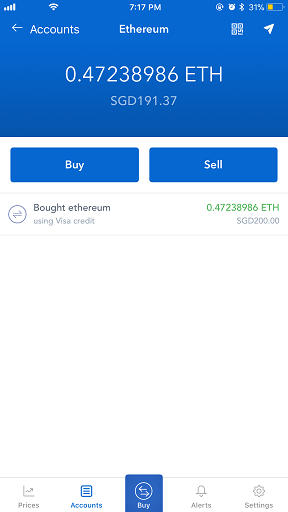 As you can see on the image above, I recently bought Ethereum coins for S$200, however within minutes, my investment went down and worth less became S$191.37 – I lost about S$8 in this case. So investment does pose and carry risks. See my other posts related to investing and investment and how to have positive cash flow, here. 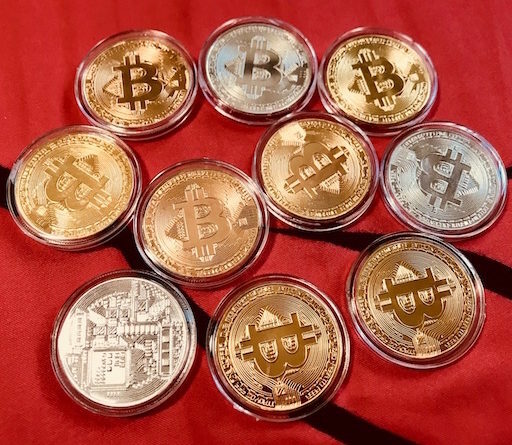 Last, the purpose I wrote this article to you and to the world is to share my own experience in buying and transacting Bitcoin and other altcoins, hoping for those who are looking to buy Bitcoin and other altcoins can get helped with step by step I have provided above and worry no more to make your first cryptocurrency purchase. I get no commission at all from Coinbase for writing this article and this is not a sponsored post by Coinbase. 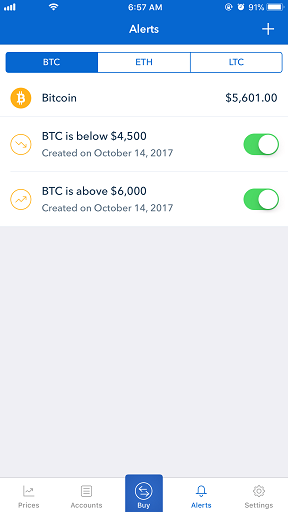 If you do registering using my referral code here, yes not only I will get commission in forms of $10 worth of Bitcoin, but at the same time you will also get $10 worth of Bitcoin — after you made buy/sell transaction worth of $100. There’s no obligation for you to register using my referral code anyway. If you have Android devices and are thinking to mine cyrptocurrency coins yourself, I have a way to do it. Do check here. 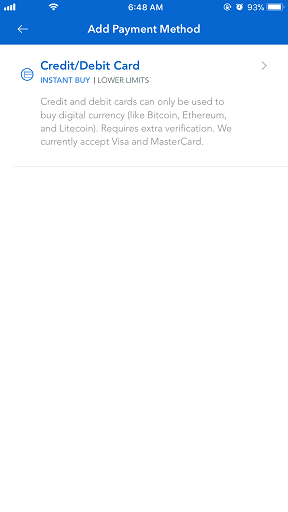 So that’s how I met with Coinbase, buy my first Cryptocurrency coin (which is Ethereum) using Coinbase. I’m hoping the value of Ethereum could sky-rocketing like its older sibling: Bitcoin. If you have queries related to setup Coinbase, buy Cryptocurrencies, do throw them at comment section below. I’ll be more than happy to give suggestions and help you to make your first investment in Cryptocurrency world. Cheers! Kopi O Siew Dai: Guide to Order Coffee and Tea in Singapore Like a Pro! Hi there! Thanks for the article. I can recommend for you to visit linkkoin.com. I am using it for short time but it’s fine, very low fees and fast verification process.